OMG, you won't believe this! It's a big week for The Ford Institute! First, we launched the Integrity Movement. Come join! And now comes huge news from Debbie Ford's sister Arielle that a previously unpublished manuscript by Debbie will be published March 6th, 2018! (Of course Debbie gets a book deal even on the other side!) Read this incredible story below and be sure to take advantage of the 24-hour sale on the e-book today only! 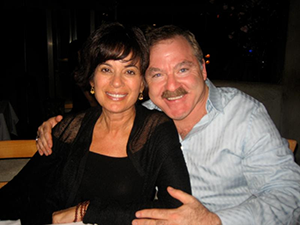 My friend (and my sister Debbie's dear friend), world-famous medium James Van Praagh called last December to invite me, Bri, and my Mom to visit his new home here in San Diego and he offered us a reading with my sister in heaven, Debbie. This was an irresistible offer, as it's now impossible to get private readings with James. During the reading, Debbie kept asking me if I would write a prayer book with her. I politely declined. How in the world would we do that? We couldn't possibly impose on James to be a daily intermediary and I didn't have any desire to figure it out. During the "reading" lots and lots of relatives from the other side came through and in between these lovely visits, Debbie would pop in, insisting we write a prayer book together. Eventually, I gave in and said yes, clueless as to how this would happen. On the drive home, Brian mentioned that he recalled Debbie talking about some prayers she had written and suggested I contact the amazing Julie Stroud, (who to this day runs The Ford Institute along with Kelly Kosow) to see if she had any of these prayers. 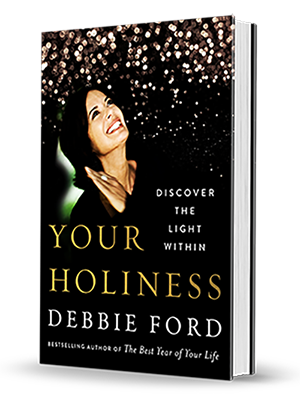 Julie, who was Debbie's right hand everything for years, immediately wrote back and said not only did she have the prayers, she had an entire unpublished manuscript entitled Your Holiness: Discover the Light Within, and it was attached to the email. Debbie wrote a prayer book and I never knew? I immediately read the book - astounded at the wisdom, the beauty, and the brilliance of it. And, then I called her editor at Harper One, who admitted that he had been feeling guilty for the past several years because he knew that she always wanted to write a prayer book but he talked her out of it. He bought the book and it will be published on March 6th with an introduction from Marianne Williamson. "Debbie Ford was a spiritual sister, colleague and teacher to me . This book, discovered as her writings after her passing is an extraordinary journey to higher consciousness . Read it, absorb her insights and you may see the world fresh, vibrant and holy and as if for the first time." "What you are seeking at the deepest level exists inside of you, in the quietude of your own inner world, in the privacy of your own sweet heart. So now it’s your responsibility, your holy responsibility, to encode your consciousness with thoughts, feelings, and images that will support you in creating the perfect internal environment to cultivate a deep and intimate relationship with the one you call God. This is the force that loves you, cheers for you, and wants it all for you. In a world where love leaves as quickly as it comes, you can rest now, knowing that you have found a love that will never leave you, never misguide you, and never ever let you down. My advice, dear friend, is take great care of that Love. It will give you everything you’ve been looking for."